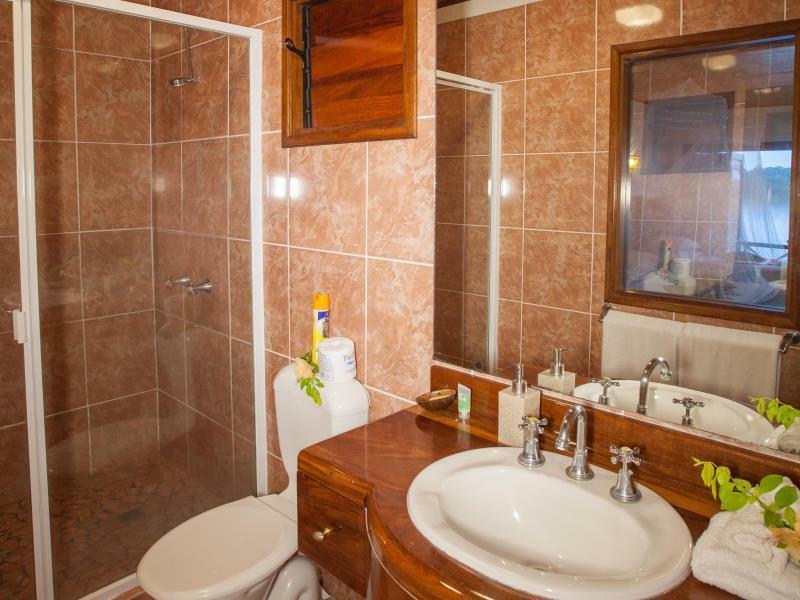 بني في 2000, Sunset Bungalows Resort هو ميزة مُضافة لـ بورت فيلا و خيار ذكي للمسافرين. يجذب هذا الفندق ذو 4 نجوم، والذي يبعد 6. Km فقط عن وسط المدينة و 10. Km عن المطار، الكثير من الزوار سنوياً. كما يمكن الوصول بسهولة إلى بلمس كازينو, فيلا سنترال هوسبيتال, سبريم كرة. إن الخدمات التي يقدمها Sunset Bungalows Resort تضمن للنزلاء إقامة مريحة. يمكن للنزلاء الاستمتاع بالميزات التالية: أمن على مدار 24 ساعة, خدمة التنظيف يوميًا, تخزين الأمتعة, واي فاي في المناطق العامة, صف السيارات أثناء إقامتهم في هذا المكان الرائع. بالإضافة لهذا,تتضمن كل غرف الضيوف مجموعة واسعة من وسائل الراحة . بعض الغرف توفر حتى تلفزيون بشاشة مسطحة, حوض الاسترخاء, مكيف هواء, شرفة/ تراس, ساعة منبه لإرضاء أكثر الضيوف تطلباً. يقدم الفندق العديد من الفرص للاستجمام كمثل كنو, حمام سباحة خارجي, صيد السمك, حديقة, رياضات مائية (غير آلية). مهما كانت دواعي سفرك فإن Sunset Bungalows Resort هو خيار ممتاز لإقامتك في بورت فيلا. Great location with views of the lagoon. Just 10 minutes by car into Port Vila. Rooms are large and very clean. A'C works well. Parking might be a problem as spaces are limited. Staff very friendly and the Restaurant was fast had a great choice of meals. Very happy with our stay at Sunset Bungalows Resort. Staff were excellent, and did their best to ensure we had a pleasurable stay. Very clean, and provided a lot of useful advice to first time visitors to Vanuatu. Would highly recommend! Sunset Bungalows is great value for Money. The staff are fantastic, the rooms are big & clean but maybe ready for a refresh - linen could do with an update. Great location - easy to get around to town, beaches & tours. Food is great & cocktail hours is the best! The grounds and bungalows are beautifully maintained even with the obvious rebuilding that is still underway in the wake of Cyclone Pam - not all the bungalows are habitable yet. No screaming kids running around is a definite plus at this place. The fare coming out of the kitchens was delicious and there was no extra charge to have it delivered to our bungalow - even breakfast, which was included in the nightly tariff (contrary to Agoda's booking details) could be delivered to the room at no extra charge. Audrey and Greg were very warm and hospitable and made sure we had everything we needed during our stay. I had requested airport transfer when I booked through Agoda which they missed as there was no one at the airport to pick us up - this however turned out to be a blessing in disguise as a private transfer which would have cost us VUV3000 ended up costing VUV400 for the two of us as we embarked on an adventure and hailed a local bus to take us from the airport to them instead. A perfect base for a short break. The managers were very helpful and engaging. We were given an extra couple of hours in our room on departure day as no one was coming straight into our room which helped us relax until the last possible minute by the pool, before we had to leave for the airport. They also arranged the airport transfers for us. friendly manager, good food and comfort room. but port vila ia quite boarded and the expense is higher than australia. We were relaxed as soon as we reached Sunset Bungalows. The room was clean and modern with beautiful, yet not overdone decore. The balcony overlooking the lagoon was a bonus too. The staff were friendly and lovely; Greg & Audrey (our hosts) were wonderful and had up-to-date information regarding tours, sites and other recommendations. It was a wonderful holiday. We had a great stay, staff very helpful. Our bungalow over the water was lovely. Friendly staff, helpful and informative reception, great room over water. Really enjoyed our stay here. The staff were friendly and were very helpful with booking activities and information. The restaurant had good food and the service was attentive. Of special mention is the cocktails, they were brilliant ! 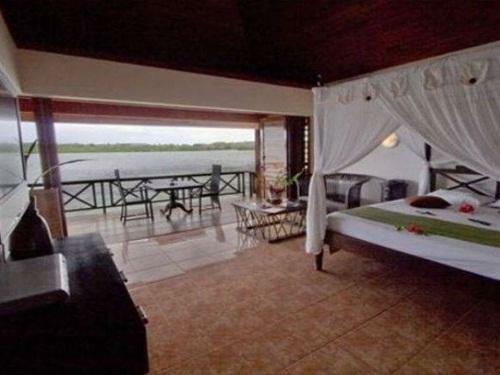 The room was comfortable and private, one end opened completely to the balcony and was over the water on the lagoon, so you need to like the sound of lapping waves if there is a breeze. Buses to Port Vila were plentiful and cheap and were available on the road right outside the hotel.Its an "adults only" place so no kids running around, which for us was a plus. Really good stay, although Vanuatu is expensive it was a great experience. i only stay there for 3 days, i found the most staffs in hotel are very nice, except the receiptionit. they always recommend me the most expensive tour and disable to give the correct travel information, in order to force me to choose the thing they recommended which is the most expensive one. they are cheating almost everything i asked and always try to sale me the tour and taxi that are running by someone they are familiar. travelled to vanuatu with my partner in april. stayed in a great lagoonside fare (strongly recommend getting a fare on the water). room was immaculate and very spacious. a great place to unwind, mornings by the lagoon are so tranquil. the staff are friendly and go out of their way to make your stay as comfortable as possible. wonderful retreat. 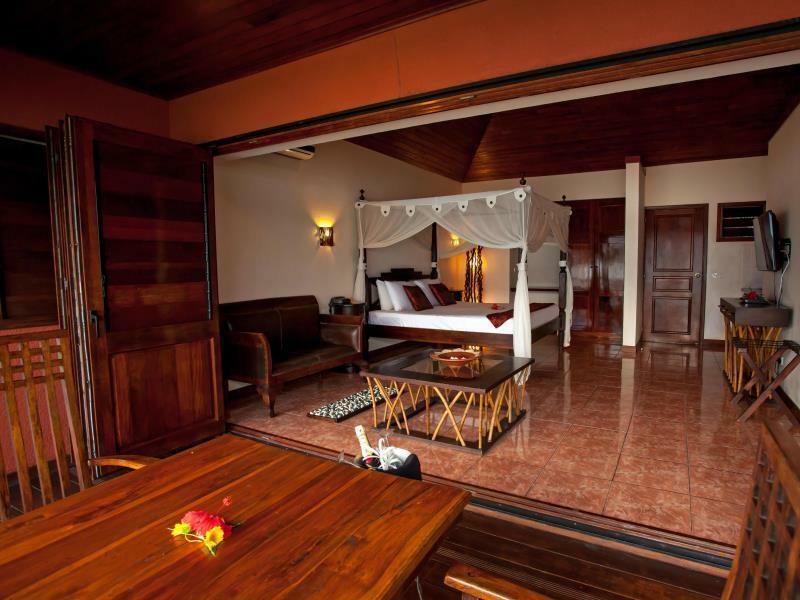 this hotel is well located from the main town but easy to get too. the staff were excellent and very helpfull. it has a great meal area overlooking the bay . the hotel is overlooking a nice bay and best of all it only caters for adults only no children. very good for honeymooners and alike. we wanted a break away from our busy work schedule so booked two nights here- after booking i read they don't allow kids which didn't bother me either way until i was there and it made the stay perfect!! we enjoyed the breakfast and had dinner one night too- really delicious. the only downside was there wasn't hot water on our first morning but they got a local business to come and fix it whilst we were away and had no further problems. the bungalows are situated side by side but at the night the mood is quiet and relaxed - it never seemed to be an issue that people were next door. the pool and gardens are a really nice touch! really appreciated the quiet lake view far from the town agitation. the manager was very helpful and gave good advices/tips regarding our trip to tanna, he obviously know the area very well. the rooms were great at the exception of the hot water that was not working in the 1st and 2nd room we had to move to, but we finally got upgraded with the honey moon suite and the jacuzzi and larger balcony made it up. th staff was ok, eventhough we found friendlier elsewhere. the food was ok too but that was the same anywhere else we went. Sorry - No pros come readily to mind. When we arrived the man at reception said he did not know anything about us and was not expecting us. And would have to make up the room. He suggested we go for a swim in the pool when they were doing this. The problem was there was no water in the Pool. It was finally full on Wednesday morning when we getting ready to leave. The local staff were very nice and pleasant but there was a non-local working on a computer when we arrived. She looked up at us and immediately returned to her work. She did not acknowledge we were there. We were the only two people standing at reception. She did nothing to make us feel welcomed. The room was probably nice some time ago – now it is ‘old and tired’ and past it’s best ‘use by date’. We went for a short kayak in two of the three kayaks. The water is semi-clear for two or three metres from the beach. So snorkelling is not a viable option there or anywhere close by that we could identify. We then went for a quick shower. (For some reason the lights in the shower and toilet did not always work during our short stay.) The hair dryer heated up but failed to blow any air – it cut out after 10 seconds or so. We took it to reception and they said they would replace it – they didn’t. Our experience of the place was so disappointing we chose to spend as little time there as possible and eat elsewhere. The only positive aspect of our stay was that the local staff were all very pleasant. We would not recommend the resort to our friends and are puzzled as to how the reviews we read prior to going were as positive as they were. Ignore Food/Dining rating as we did not eat there. Only con was we couldn't stay longer! We stayed here for three days for a wedding anniversary and I must say this was probably the most relaxing short break we have ever had. The accommodation was excellent and perfectly located (we had a ‘superior bungalow’) and we were showered with attention by the endearing and dedicated, unsophisticated staff (they made us feel like they wanted to look after us, not because they were paid to do it – special thanks to Annie, Silo, Madeleine and Max). They arranged for us to have their driver for a day and we spent a whole day circumnavigating the island being shown points of interest by the locals who know – including lunch at a locally owned ‘resort’ – and came away knowing so much more about the history and culture of Vanuatu – oh, and thanks for taking us to that kava bar, Max! The food and wine at Sunset Bungalows was excellent – with a special table display and message for our last morning - we really can’t recommend this establishment highly enough and can’t wait to get back! Hope you enjoy it as much as we did! the rooms were very large , with fantastic views out over the river, they were very tidy and wonderful fresh flowers placed in our room each day, the staff were very friendly and went out of their way to help us in any way they could, the swimming pool is lovely with a waterfall feature. 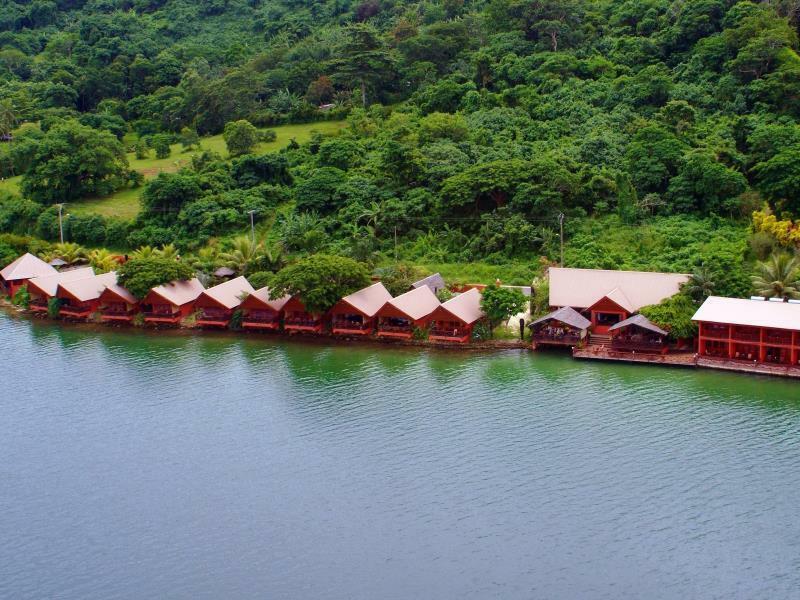 quiet location, beside a huge lagoon , not far from town, friendly staff. for our first 4 nights in vanuatu we stayed at the iririki island resort which was great then the next three nights we were booked into the sunset bungalows which is beside a lagoon about 10 minutes by bus from the towns centre. upon arriving we were told we had been upgraded to the honeymoon suite, which was almost twice the size of the other bungalows, the decor was ok, the staff very helpfull and friendly also. The restaurants menu was good as far as vanuatu standards go and prices matched those of the towns (prices for eating out in vanuatu are similar to sydney prices, although the quality of the food is seriously substandard). A word of warning though, every time, the day after eating at the restaurant (we had one dinner there, one lunch and a couple of breakfasts) we both felt as though we'd had had a bit of food poisoning, not sure if it was because of the food or not, but the breakfasts were especially bad. Overall we were pleased with our stay, it's ok for value for money for vanuatu standards and although we won't be staying there again, it's only because we wouldn't go back to vanuatu again, port villa anyway! Go to one of the other islands!! That said the locals are probably the friendliest people in the world and i don't think i've ever felt safer than anywhere else in the world!